This sentence encapsulates the findings of a recently published study ‘Behavioural assessment of pain in 66 horses, with and without a bit.’ (Cook and Kibler, 2018). Horses can be ridden with or without a bit. Comparing the behavior of the same horse in these two modes made for a ‘natural experiment.’ Sixty-six riders who switched their horse from bit to bit-free completed a behavior-based questionnaire before and after the switch. The number of behaviors shown by each horse, first bitted and then bit-free, was counted and compared. Sixty-nine behaviors were identified as being caused by bit pain. After mostly multiple years of bit usage, the time that horses had been bit-free before being assessed a second time was just over a month (35 days; with a range from 1-1095 days). The number of bit-pain signs exhibited by each horse when bitted ranged from 5-51, with a median of 23; when bit-free the number ranged from 0-16 with a median of 2. The number of behavioral signs of pain for the total population when bitted was 1575 and bit-free 208; an 87% reduction within a nominal month. The term ‘bit lameness’ was proposed to describe a syndrome of ridden-horse lameness identified by using up to 69 signs of bit-induced pain. Only one horse showed no reduction in behaviors related to pain when bit-free. By removing the bit, the welfare of 65 out of 66 horses was enhanced and the risk of bit-related accidents minimized. The purpose of this article is to introduce the study to owners, riders and administrators in the horse industry. Although bits have been used for 5000 years, the first data on bits was not published until quite recently (Cook and Mills 2009). During a filmed demonstration at the 2008 Annual Conference of the Certified Horsemanship Association, four riding-school horses who had been bitted all their lives were switched from bit to bit-free. The riders’ concurrent four-minute performances, first bitted then bit-free, were scored by an independent judge. Scores increased from an average of 37 (‘fairly bad’) when bitted, to 64 (‘satisfactory’) when bit-free just a few minutes later. Are they reversible when the bit is removed? [Answer: In 65 of the 66 horses they were significantly (i.e., statistically) reversible. All riders rode ‘English’ style. Horse age ranged in age from three to 24, with an average of 10 years. Breeds varied, as did their predominant disciplines. None of the horses were racehorses. The study population was not a random population. Click image to view full-size text. Prevalence of 69 bit-pain indices in 66 horses, when bitted and bit-free. The mean reduction of indices when bit-free was 85% (range 43 to 100) with a median of 87%. Many of the bit-pain behaviors jeopardized the safety of both horse and rider. All were ‘unwanted’ behaviors. Key: Upper case letters mark four of the five major categories of fear-induced behaviour (the five ‘F’s) in the questionnaire; i.e., fright, flight, fight, freeze, and facial (trigeminal) neuralgia. Pain indices exclusive to the bit are shaded grey. Biologists refer to negative and positive stereotaxis and, unsurprisingly, horses in the wild exhibit both modes. They move away from predators (negative stereotaxis) and move towards food and water (positive stereotaxis). But the horse’s dilemma when faced with a bit is that it can neither avoid nor engulf it. Because the bit is strapped into its mouth it can neither be spat out nor swallowed. Behavioral signs of bit pain are either general signs of discomfort (e.g., chewing on the bit, tail swishing, fidgeting, jigging, ‘arguing’) or desperate and mostly foiled attempts to move away from the bit (e.g., by opening the mouth, tossing or tilting the head, pig rooting, bucking, rearing or bolting). If unable or disinclined to distance itself from the bit by dislodging the rider (could shying be a learned strategy?) a horse will defend itself from the bit in a variety of ways. These include grabbing the bit between the first cheek teeth, pinning the bit under the tongue, or placing it against the front edge of the lower first cheek teeth where it causes less pain – so called ‘pulling’ on the bit. Collectively, bit-pain behaviors are stereotypical behaviors; the “responses of normal animals to abnormal environments.” We have thought until now of stereotypies as being problems of the stabled horse, like crib-biting and weaving. This limitation appears to be incorrect. Stereotypies, defined as “repetitive behaviours induced by frustration (and) repeated attempts to cope” are very common in the ridden horse. Gum is periosteum – the ‘skin’ of the bone and its most sensitive part (think ‘sore shin’). A bit pressing on the bars of the mouth is pressing on bone. A bit pinching the tongue between metal and bone is no better, as the tongue itself is a sense organ. Finally, a bit stretching the lips (in racehorses to twice their resting length) is stretching the most sensitive region of another sense organ, skin. Think ‘agony-in-the-dentist’s-chair’ when even only one corner of your mouth is maximally retracted. It follows that expecting a horse to ‘accept the bit’ is unrealistic. Aversion to a piece of metal in the mouth is a natural instinct ‘hard-wired’ into every horse. The acid-test that any rider must complete before claiming that their horse ‘accepts’ the bit is to demonstrate to independent and qualified witnesses that their horse shows no improvement in behavior when the bit is removed. Bit-induced ‘learned helplessness’ is resignation, not acceptance. Current animal welfare thinking supports the concept that animals experience both negative and positive emotions – pain and pleasure (Mellor and Beausoleil, 2017). Happily, as in the lyrics of an old song, removing the bit ‘accentuates the positive.’ The final column of the above chart lists the pleasurable experiences that horses appear to enjoy when bit-free. I predict that studies on racehorses will reveal many more signs of bit-induced pain. It is my opinion, for example, that by breaking the lip seal and allowing air into the back of the mouth, bit-induced soft palate instability may lead to a cascade of poor performance, asphyxia, falls, dislocations, fractures, ‘bleeding,’ and sudden death. A bitted rein, under tension, can harm an exercising horse in (at least) three ways. It can do this directly by causing pain, as exemplified by this study. Indirectly, a bitted rein also imperils a horse’s basic need for freedom to move its head. With poll flexion (not even hyperflexion/Rollkur), the airway is obstructed, the work of breathing is increased, chest pain may occur and premature fatigue can follow. The same effects can follow from rein tension limiting the natural swing of the head/neck pendulum at the canter or gallop. The ‘head-bob’ is a vital energy-saving mechanism for both breathing and striding. Finally, and also indirectly, the bit can cause asphyxia by breaking the lip seal. With air in the mouth and back of throat, the soft palate is no longer sucked down onto the root of the tongue and a running horse can be suffocated, with disastrous consequences, i.e., waterlogging of the lung (‘bleeding’) and sudden death. A bit in the mouth prevents a horse from breathing freely. Like the rabbit, a horse is a ‘nose breather.’ A bit triggers digestive system reflexes (e.g., salivation and swallowing) when what an exercising horse needs is an exclusive focus on respiratory system reflexes. Thus, a bitted horse is physiologically handicapped by being expected to simultaneously ‘eat’ and exercise. Last year, a magisterial review and synthesis of ridden-horse welfare was published, with a focus on breathing, breathlessness and bridles (Mellor and Beausoleil 2017). Now, with observations on pain as a cause of incoordination, imbalance and gait abnormalities (‘bit lameness’), another piece of the puzzle has been added. Readers might question why it is that only 69 signs of bit pain are listed, yet this article’s title refers to 70 reasons for not using a bit. With tongue in cheek, my not so ‘lame’ excuse is that the 70th reason is stereotaxis! A pain in the mouth can change the whole of a horse’s ‘body language.’ The behavioral changes are expressed in one or more parts of the body; head, neck, back, limbs and tail. With one exception (‘excess salivation’), all the bit-induced behaviors identified in this study were signaled by abnormal behaviors expressed through the musculoskeletal system, i.e, by abnormal movement. Bit-pain leads to impediments in the gait. It can render a horse apparently ‘unsound of limb’ when, in fact, the problem is a pain in the mouth. Collectively, the behaviors were manifestations of musculoskeletal pain, expressed by abnormal movements of the head, spine and limbs. They ranged from too little movement (e.g, stiffening, freezing) to too much movement (e.g, bucking, bolting). That horses may exhibit a few aversions to the bit is well accepted. That aversion is ubiquitous is not. The study showed that 65 of 66 horses exhibited demonstrable aversion to the bit and that horses have not less than 69 ways of exhibiting frustration, attempts to cope and efforts to avoid bit contact. The one horse that showed no improvement following removal of the bit (a persistent ‘headshaker’) may have been suffering from an especially persistent form of bit-induced, facial neuralgia. A conclusion of the study was to propose ‘bit lameness’ as a collective term for 68 bit-induced behaviors. Such a term is more specific than ‘bridle lameness’ and is readily tested. Removal of the bit is recommended at an early stage in the work-up of any ridden lameness of unknown origin. 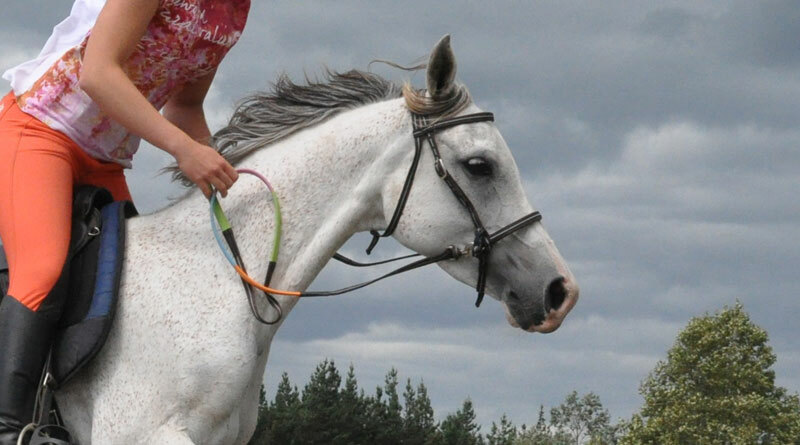 Tight nosebands can cause damage to nerves. Administrators, judges, instructors and riders need to recognize that a horse is programmed by evolution to evade the bit. A bitted horse should not be blamed for such behavior. A rider who tries to prevent a bitted horse from opening its mouth by using a crank noseband is using a misguided and ethically unacceptable approach. It would be appropriate for competition stewards to require such devices to be removed before a horse enters the ring. One fine day, bits themselves may well be banned. Thus, over the past 20 years, the evidence indicting the bit has become increasingly compelling. Apart from this study and other fact-based studies, the evidence has been ‘field-tested’ and endorsed by a rising swell of bit-free riders worldwide who previously used bits and have now eschewed them. Crucially, after two decades, no evidence has been published to refute the statement that an oral foreign body is physiologically contraindicated (Cook 1998). There is no evidence to justify the mandatory use of the bit in any discipline. The bit is an obsolete legacy of a period in history when the horse was a weapon of war. ‘Pleasure’ riders can already choose to relegate their bits to collections of bygone artifacts. Competition riders may wish to reconsider whether to continue competing while mandatory bit rules remain in force. A deficit in the husbandry of captive animals has been defined as “something that the animal would change if it could (e.g. a motivational deficit linked with frustration; a health deficit linked with nausea or pain; or a safety deficit causing fear).” For 65 of 66 horses, the bit was a definite deficit. The horses were happier when bit-free and the rider safer. Performance was not assessed but it can be inferred that prevention of pain promoted performance. Dr Cook’s article was first published in the online journal, The Horse’s Hoof. Professor of Surgery Emeritus, Tufts University, Cummings School of Veterinary Medicine, Massachusetts, USA. We currently utilize a Dr. Cooks bit-less bridle on our farms primary thoroughbred stallion. He actually has better brakes and is easier to control his speed. As Slewquero is a very smart horse he at times can evade directional control. So to have him not realize that he could go in whatever direction he wants to at times, we have to use a snaffle bit so that he realizes he must accept going in the direction we ask. We went to utilizing a bit-less bridle because at times Slewquero would not open his mouth to accept a bit! As he is very strong, it was not wise to just ride him in a halter which of course he seemed to prefer. We switch back and forth with bridles depending on Slewquero`s mood of the day.